A 16-year-old passenger died Monday after being injured last week in a Pearl Harbor helicopter crash, hospital officials said. HONOLULU (AP) — A 16-year-old passenger died Monday after being injured last week in a Pearl Harbor helicopter crash, hospital officials said. His family has decided to donate his organs, Gidget Ruscetta, chief operating officer at Pali Momi Medical Center, said in a statement. 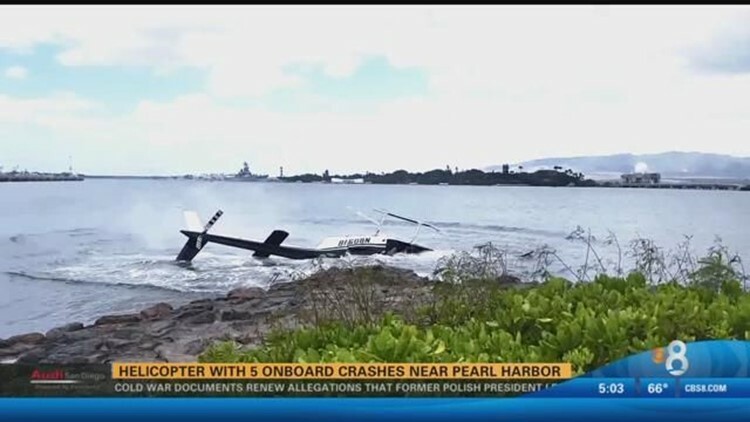 The teen and three family members visiting from Canada were aboard a tour helicopter when it crashed into the water near the Pearl Harbor Visitors Center on Thursday. Two family members remain hospitalized in stable condition. Another was treated and released. No information was available for the pilot, who was taken to another hospital. Federal agencies are investigating the crash. The boy was trapped underwater and had to be cut free from his seat, according to witnesses. Federal records show the helicopter is registered to Jeffrey Gebhard of Kailua, Hawaii. The Navy said the helicopter reportedly belongs to helicopter tour company Genesis Aviation. The website for Genesis Helicopters says it was founded by Gebhard. A call to Gebhard was not answered on Monday. Civilian divers floated the helicopter to the surface Friday and a crane pulled it out. The Navy said the aircraft was taken to Genesis Aviation's hangar at the airport, where the National Transportation Safety Board will conduct an investigation. It was the second major crash this year involving helicopters on Oahu. Twelve Hawaii-based Marines were killed when two military helicopters crashed during nighttime training on Jan. 14. Both aircraft were CH-53E Sea Stallion helicopters that were part of Marine Heavy Helicopter Squadron 463.